Kimi Raikkonen's victory in the United States Grand Prix was one of the most popular I've witnessed in my many years in the sport. Although the huge press room of the Circuit of the Americas was sparsely populated - and with not one single Finnish journalist sitting there, as the TV crew was already out in the paddock - it erupted into spontaneous applause when the Ferrari driver crossed the finish line, to put an end to a 113 Grand Prix winless streak. 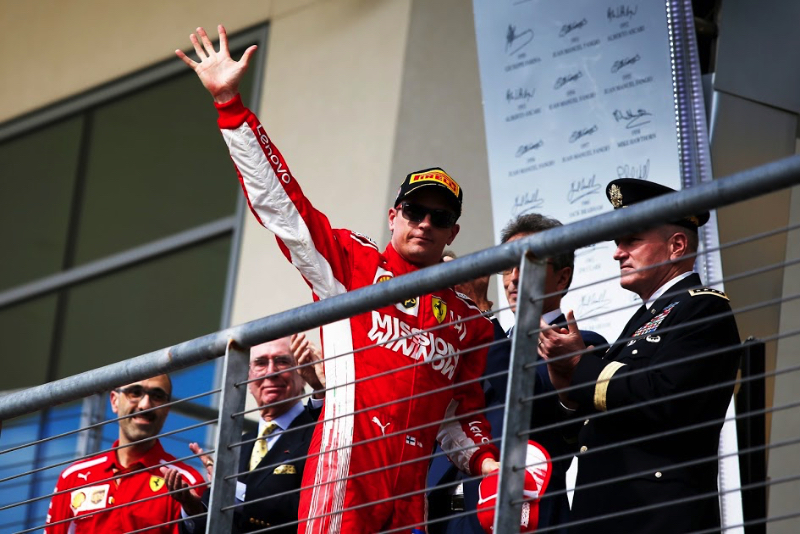 The same happened when Raikkonen showed up for the press conference with even rival team members applauding him and, after the race in Austin, there was a general "feel good" vibe down the paddock. He may not be a man of many words, may be unnecessarily harsh sometimes, but Raikkonen is a popular man within the Formula One community and that showed on Sunday. Of course, the Finn has been in for quite a lot of criticism, for his lack of results in nearly one hundred Grand Prix with Ferrari, on his second coming to the Scuderia, and in many occasions he performed way below expectations. The whole of 2014 was tremendously disappointed - but the story of how Alonso had such a big advantage over the Finn will be told one day, as things were not that straightforward - but on many occasions, over the last four years, there was the feeling a win for Raikkonen was just about to come, just for something to go wrong, one way or another. But right from pre-season testing in Barcelona, there was something different about this year's Kimi Raikkonen: he had a car that suited his driving style perfectly and his confidence levels rocketed up. Even though the first of running was more snowed off than rained off, by the end of his two days of proper running the Finn told to those working with him, "this is my year, with this car I can win!" Famously, the veteran driver hates understeer and his natural instinct, when handed a car with such characteristics, is to brake earlier and make sure the front end turns the way he wants it to. Efficient in terms of reducing the effect of the understeer, but also slower than trying to bully the car to take the corner. And that was a common characteristic to the last few Ferrari, especially in 2014, so it was no surprise he didn't perform to the level expected from him until the start of this year. Once the season got going, Raikkonen was on it, but something was always missing. Several potential pole positions were lost to minor errors, the most obvious one coming in Baku, where he had been head and shoulders faster than anyone else before the start of Q3. On his first run, though, going faster than all his rivals, the Finn ran wide at the last proper corner and was, therefore too slow on the long run down to the finish line. His second run, though, was even faster than before, some 0,3s quicker than Hamilton at the end of S2, so he braked earlier for the corner that had caught him out on the previous run. But knowing he needed a good exit from that corner, Raikkonen was too aggressive on the throttle, the SF71H snapped and what would have been a comfortable pole position became P6 on the grid. Maybe all those years away from the proper front line, unable to push the car the way he liked, had taken the edge away from the Finn. And yet, the feeling a Grand Prix victory was just around the corner never left a good section of the paddock. Then, of course, team order came into consideration and on quite a few occasions Raikkonen had to sacrifice his own race to help Vettel's title bid, so it was clear the only way he could win before leaving Ferrari was on a day when the German would be out of contention. Although he was a bit quicker than the Finn in Austin, Vettel did two favours to his team mate in Austin: first, incurred on a grid penalty for not slowing down enough during a Red Flag period in FP1; then, understeered into Ricciardo and spun close to the end of lap one of the race, dropping to P14. Now Raikkonen was in the lead and the chances Vettel was ever going to be a factor in the rest of the race were slim. By then the Finn had done what he had to do: on softer tyres he out-dragged Hamilton off the line, wasn't intimidated his swerving left, braked later than the championship leader into Turn One and off he went. There was, though, a factor that played against Raikkonen: his softer tyres were bound to degrade faster than Hamilton's and he could be forced into a two-stops race that would reduce his chances of success. So, the old hand showed he still remembered all his old tricks and went fast enough to remain at the front, while going slow enough to keep his rear tyres alive until lap 21. On new tyres, he had to do it all over again – go fast enough to be way within Hamilton's pit stop window and the inevitable second stop of the W09 would come, while preserving his new rear tyres. And that, again, was done to perfection. But eventually, as he admitted, "you know these tyres will eventually go and when they do there's nothing you can do." The trick was to delay the grip drop as much as possible and get it when Verstappen and Hamilton also ran into trouble. The brief battle between these two, on lap 54, gave the Ferrari the buffer he needed to take it easy on the last lap and win, 2044 days after starting the 2013 Formula One World Championship in style by winning in Australia. If his driving made justice to the Iceman tag, his first reaction after crossing the line was the perfect summary of his, and everyone else's, feelings: "About f...ing time!"